Wythall Scouts and Beavers Have Radio Fun! 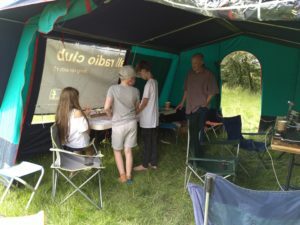 Our local Scouts and Beavers discovered the joys of amateur radio when Wythall Radio Club visited them during June. The 1st. Tidbury Green Beavers – aged 6 to 8 years – tapped their names in Morse code and used the phonetic alphabet to send messages to each other over hand-held radios. Lee G0MTN and Michael M0IEQ were on hand to run the activities, assisted by the Beaver leaders and parents. The keen Beavers soon got the hang of these communication skills! Other members of the Club ran a special event station for 1st Tanworth Scouts‘ 60th anniversary fete. This followed two evenings where the Scouts were introduced to amateur radio and passed greetings messages over air. Dave G3YXM showed his expertise at casting a fishing line, enabling the team to haul up an antenna between two tall trees. 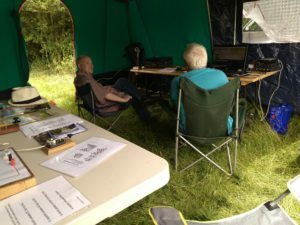 David G0HVN and Ian 2E0LQY helped young visitors to send their names using Morse code. They also used voice and digital communications to contact stations around the UK and Europe more widely. We will be providing more radio experience for Scouts and Beavers during Jamboree on the Air later this year. Morse successes at Wythall Club! 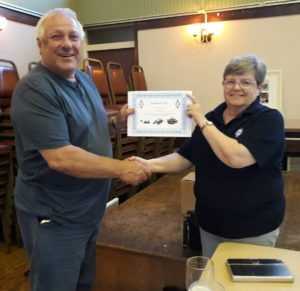 May is “Morse Code Appreciation” month at Wythall Radio Club – and some of our new members received special awards to mark their progress in learning the ‘dots and dashes’! Harry M6NKW, Stuart M0SRZ, Ian 2E0LQY and Kim M6SSV were singled out for special praise. Kim made his first ever Morse code contact – with a station in Germany – during one of the Club’s Friday morning ‘open shack’ sessions. 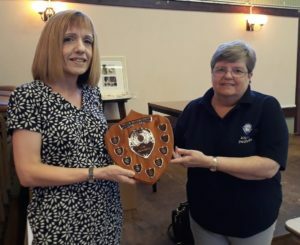 The overall winner of the Lew Williams Memorial Shield was Sue 2E0LUJ. She not only learnt Morse code but also built a small transmitter/receiver. The Club also recognised the contribution of members who teach and promote use of Morse Code, awarding certificates of commendation to John 2E0XET and John G4OJL. So very well done to our members, and we look forward to hearing you try out your new skills on the air! Wythall Radio Club is pleased to announce that GB3WL, our 432Mhz repeater is now back on the air. Thankfully the the flood damage was not too severe and power has now been restored.